As the end of summer was near, Back to School was becoming a reality. While our employees were shopping for their own kids, we could not help but think of our local community. The end of the summer is near and kids are headed to the store to pick out their favorite color markers and the hottest character bookbag. Unfortunately, not all kids in Baltimore have the means to purchase the essentials. Join us in helping them start the school year set up for success! 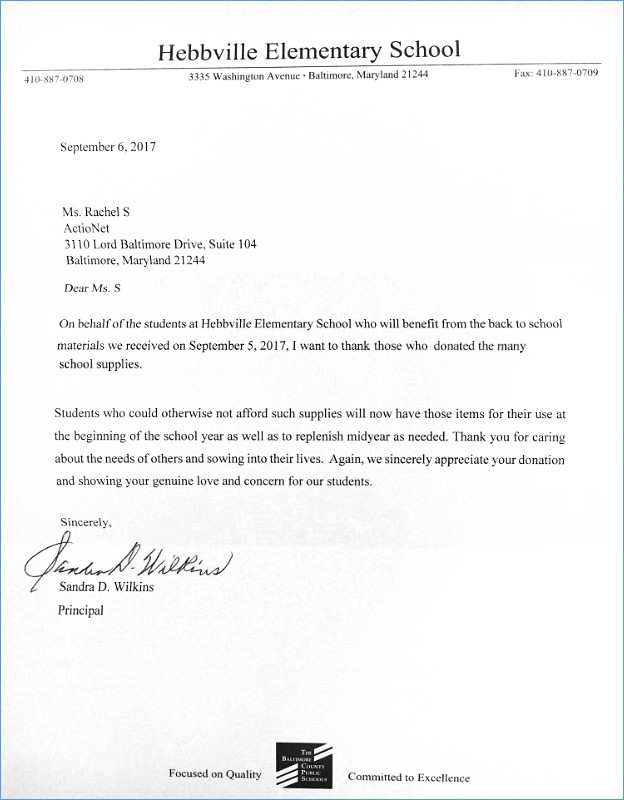 Supplies will be delivered to a local school by the ActioNet office – Hebbville Elementary in Baltimore, MD. Supplies were hand-delivered to the school just in time for the beginning of the new school year. A letter of thanks was received by Hebbville Elementary and we were grateful to have the opportunity to help children be set up for success!